After a busy weekend things are slowly going back to normal around here. The house is very slowly getting cleaned up (who knew a birthday party and having family staying here could muster up so much laundry and garbage??) and the munchkin is finally settling back into his old routine. Anyways, I had completely forgotten to post about this, but for some reason I am obsessed with getting the munchkin all things pirate and skull and crossbones related items. 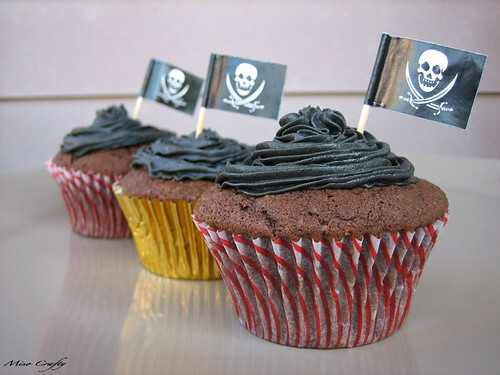 So it was only natch that I make his first birthday a pirate themed party. Brett and I decorated the house with white, red, and gold streamers, plain black and white balloons, random helium-filled metallic balloons that had a pirate-y skull printed on both sides, and served appetizers on plates that looked like treasure maps. 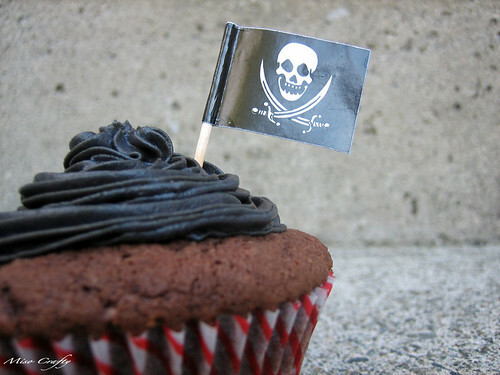 Even the happy birthday sign was made with black and white card stock, using a pirate-like font to spell out happy birthday. 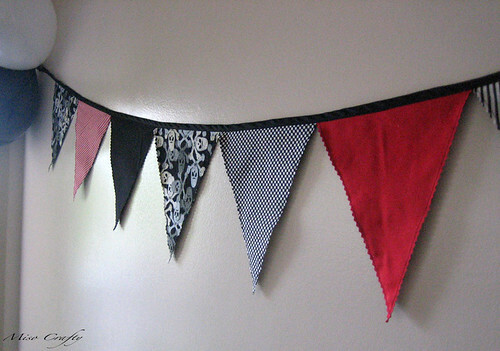 If that wasn't enough, I had quickly sewn up a few buntings to put around the house (yes, can you say overkill??). I already had the right fabric in my stash so I didn't even have to go hunting for fabric that would fit the bill. 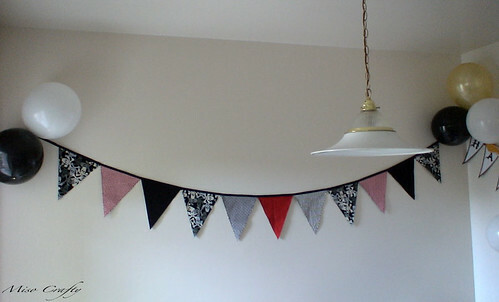 I've never made a bunting before, but it looks pretty darn easy and didn't think it was something that you really would need a pattern or directions for. So I winged it and I think it turned out great. I used a piece of card stock to draw up an 8" x 9" triangle template and had cut out the fabric using my trusty rotary cutter. I made more work for myself by making the bunting reversible rather having just a single layer of fabric with no backing. 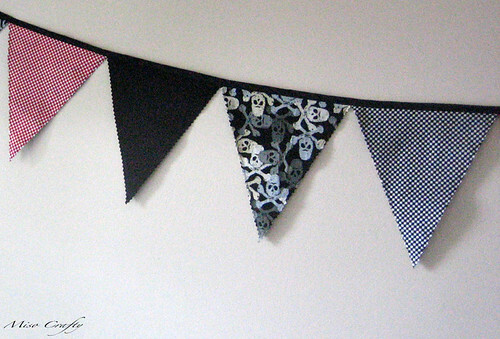 So on one side of the bunting it's all the different prints that I used, and the other side is strictly the skull and crossbones print, which I forgot to take photos of. To make it somewhat easy on myself, I just sewed the fabrics wrong sides together instead of the whole right-sides-together-then-turn-it-right-side-out deal. I wanted to give the edges a more so-called ragged look to them, so I had bought a pinking blade for my rotary cutter to trim the edges. Let's just say, I'm in complete and total love with the pinking blade!! Best invention ever! It had definitely made this little project go by much faster. I probably would have been sitting in my kitchen for at least an hour trimming all those triangle edges with my chunky old pinking shears that are in dire need of a good sharpening. With the pinking blade, it took me less than 10 minutes to clean up those edges! Pure love! Anyhoo, once the triangle pieces were ready, I used pre-packaged extra wide, double folded bias tape in black to sew the bunting together. Easy peasy. And they were such a hit! 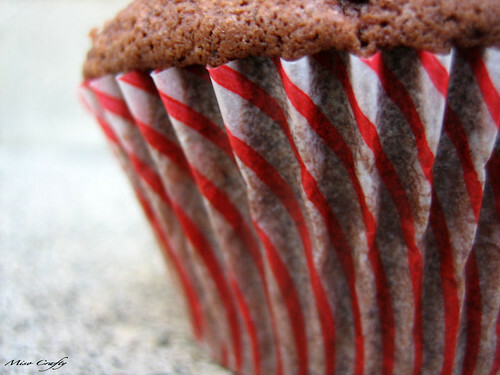 The munchkin himself got his very own oversized cupcake to enjoy! Unfortunately I didn't take any photos of it cause I was still decorating the cupcakes as the guests were arriving and was in such a hurry to get everything done that I had completely forgot that I even owned a camera at that time. Oh well, I'm sure I'll be using the giant cupcake pan (which I had bought specifically for the wee one's big day) again real soon, as I'm determined to master it...for future reference, of course! That bunting is so cool. I know I am going to go totally over the top planning birthday parties when I have kids. Thats what you get when you study event management. oooh, If I were a little munchkin I would love to come to a party at your place, or even if I were a big munchkin! Thanks! While planning the party everyone kept telling me that the munchkin won't remember a thing and blah, blah, blah...I did this for me mainly. I need to practice and prepare myself for at least another 15-16 years of birthday party planning!